I wish I could recount some exciting Costa Rican birding experience that involved dancing my way across a column of army ants while expertly digiscoping a face-off between Black-crowned Antpittas and R.V. Ground-cuckoos as Ocellated Antbirds watched from the Heliconia sidelines. Such Jedi-style adventures will have to wait until 2013, though, because I am currently in the land of gulls. Niagara Falls is also known as the Honeymoon Capital of the world but the real attraction in my home town are the gulls. Blizzards of them rise and fall above the rapids that rush to the edge of the cataracts. Below the falls, a few thousand other Larids grace the lower river with pale elegant flight, and stirring cries. It’s downright magical and although I have been here for a week, I still need to get in some quality gull-watching time. I’m not so eager to expose myself to the bone-jarring cold of a Niagara winter but doesn’t magic always come with a price? I also need to study the rafts of scaup on the river to brush up on Greaters just in case I come across one in Costa Rica (which would be a major rarity since there is just one fully documented record for the country). Glittering hummingbirds are more common than ducks when birding in Costa Rica. Slaty-breasted Tinamou: It seems like I should have at least heard the low-pitched tune of that wily, reddish-legged dumpling of a bird while birdwatching in Sarapiqui and Laguna del Lagarto. Fasciated Tiger-Heron: I usually get this one during the course of the year but despite much checking of rocky rivers and streams in places where I have seen them in the past, no dice on the thick-billed Tigrisoma! A Fasciated Tiger-Heron at Chilamate, Costa Ricam from 2011. 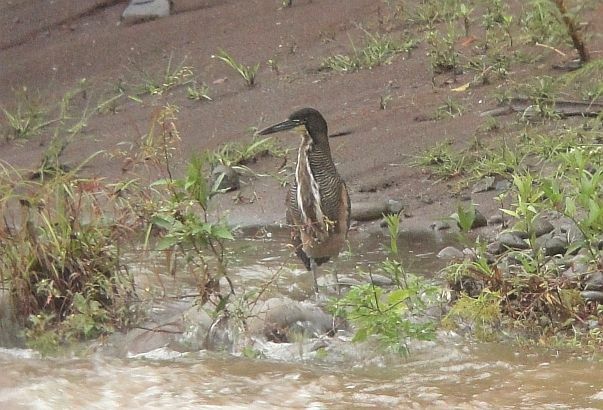 Sunbittern: While we are talking about rocky rivers, I might as well mention that I also missed Sunbittern! I probably would have seen one if I had waited by a suitable spot for a few hours but I didn’t feel like doing that in 2012. I might in 2013 though because I’m thinking of doing a sort of more serious Big Year. Wattled Jacana: This species is a rare vagrant in Costa Rica but I mention it because I am pretty sure I glimpsed one at a marsh near Cerro Lodge. It was just a moment and at a fair distance but I am 99% sure that I saw red on the bill and that the bird looked blackish. However, it didn’t come back out of that distant marsh so I don’t feel right about counting it. Buff-breasted Sandpiper: They were at the airport again and I looked for them on several occasions. Hopefully next year. 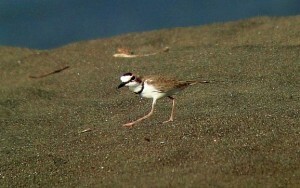 It’s much easier to see Collared Plovers than Buff-breasteds. Franklin’s Gull: I’ll put this one on the list because it’s a common migrant in the right places. I just didn’t go to those right places at the right time of year. Hooded Merganser: This lost little duckie showed up at Pocosol but I could never find time to go and see it! Will it show up again? Well, I could also win the lottery but I don’t count on it. Great Potoo: I figured that I would have at least heard a “BAAWK! !” from one of these huge nocturnal creatures. 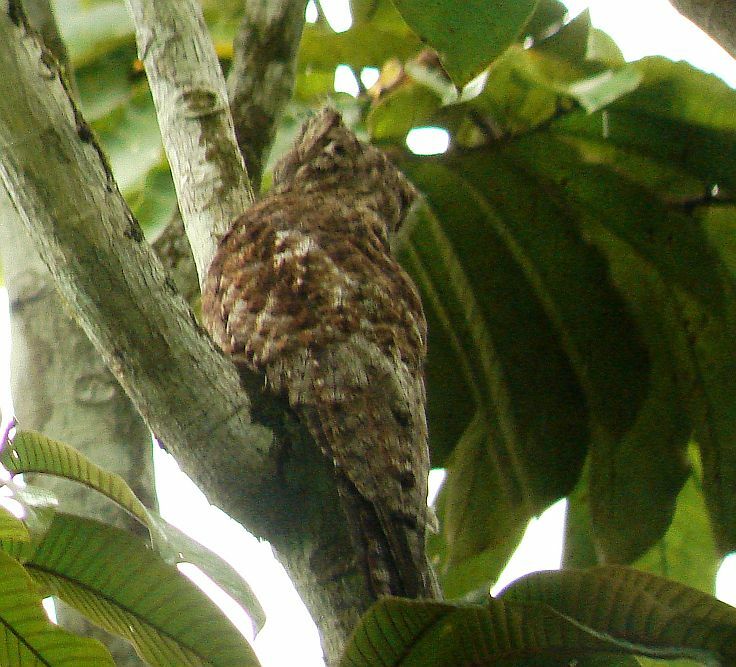 Yes, Great Potoos usually resemble a big, bunch of feathers when espied during the day. Magenta-throated Woodstar and Scintillant Hummingbird: I just didn’t look long enough at the right elevations for these two tiny species. Will probably get both of them on a trip to El Toucant in January, 2013. Black-headed Antthrush: Since I usually at least hear this rain loving antbird in foothill forests near San Ramon, I kind of wonder if I did identify one but forgot to mark it down. Tawny-chested Flycatcher: It’s a rare one alright! Now if you shell out the bucks for Rancho Naturalista, you are almost certain to see it. I did little birding out that way in 2012, though, so no oddly rare flycatcher for me. Sharpbill: I usually get this weirdo at Quebrada Gonzalez. I guess it just wasn’t giving its high-pitched crazy descending call while I was birding those foothill forests. Ashy-throated Bush Tanager: Another bird that I usually get at Quebrada…I wonder if I saw it and forgot to make a mental note. It’s not exactly a flashy bird so that could be the case. 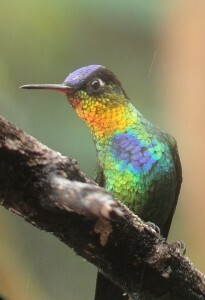 Since the Costa Rica list is around 900 species, I also technically missed well over 250 birds. With that in mind, I better go birding as soon as I get back to Costa Rica! In the meantime, I’ll watch some gulls and hope for crossbills in Western New York.